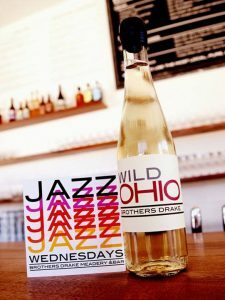 Home > Jazz News > Brother's Drake Now with "Jazz Wednesdays"
Brother's Drake Now with "Jazz Wednesdays"
Local Meadery and bar, Brother’s Drake, has been a proud supporter of live jazz since the inception of the bar several years ago just off of East Fifth Avenue and High Street. Up until now, jazz artists would play sporadically throughout the month but now they have their very own day. Brother’s Drake is now introducing “Jazz Wednesdays”, where every Wednesday the Meadery will showcase different styles of live jazz and where you’ll find some of the city’s best musicians on stage. Jazz Wednesdays are the nights to grab your friends, buy a couple bottles and spend the night on the only patio in town you can enjoy the best in our city’s live jazz from. Jazz Wednesday’s will start at 9pm and run until about Midnight. The acts will vary but the music will be some of the best live jazz in the city. Thanks to Brother’s Drake for providing a great outlet and home for jazz musicians in Columbus. Please help support the cause, show them that live jazz is in demand and visit every Wednesday evening.